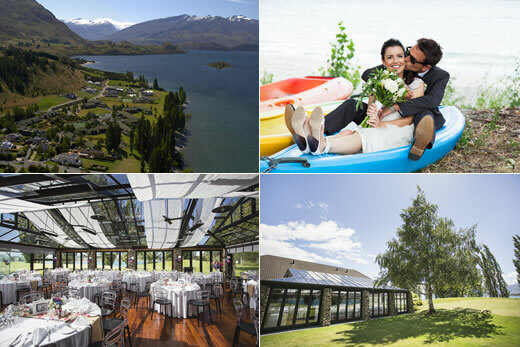 Celebrate your love in the stunning surroundings at Edgewater on the shores of Lake Wanaka. Your ceremony, reception and accommodation are all in one spectacular location. Edgewater is the only wedding venue located on the shores of Lake Wanaka, boasting the best views in town. It’s unique location and exquisitely manicured rolling lawns are ideal for a garden ceremony. Edgewater can cater for intimate weddings of two and up to larger weddings of 140 guests. In addition to an exceptional location, when you choose Edgewater for your wedding, you will have your own personal on-site Wedding Co-ordinator. From your first enquiry to the last dance on your wedding night, every detail is taken care of. >Whether you choose to have your ceremony on-site or at another location, immediately following your ceremony your guests can gather on our lakeside terrace for champagne and canapés. Stunning photograph opportunities abound on our sprawling park-like grounds. With an on-site helicopter pad, you and your bridal party can be whisked away to the majestic mountain tops. Following the canapés, your celebrations continue as you and your guests move into the wedding reception venue for a delicious meal, speeches and dancing. Whether your wedding or civil union celebration be intimate, or just a little larger, Edgewater caters for your every need, including all guest accommodation. Edgewater will ensure your special day is everything you dreamed of and more.